With Industry 4.0, the manufacturing world is embracing the very significant efficiencies and cost benefits to be gained through sensing, collecting and analysing data through many disparate sensors out in the field. The advantages are clear: adopting IoT brings about a more connected ecosystem with data gathered every second of the day or night by small autonomous devices, in real time. Analysis of this data then brings about continuous improvements to processes within the “Smart Factory”. Connecting production stages, streamlining management processes, refining logistics, optimising safety, benefitting from predictive maintenance and bringing down operational costs can all contribute to huge overall performance increases. But this can all be negated if sensors run flat. We need to think about how we provide power to these many sensors, consistently, reliably and safely. For companies making huge investments in IoT, the cost impact alone of repeatedly accessing thousands of sensors to address power issues would wipe out efficiencies and compromise performance. Developing a Smart Factory is key in many manufacturing companies’ agendas, but what about ensuring that systems aren’t disrupted by needing to recharge or replace batteries? Add to this the complication of reaching hostile environments such as mines, offshore drilling stations or heavy vehicles out in the field and the problem is multiplied. Imagine finding you don’t have the data you should have collected because the battery powered down. The moment just one sensor goes down, you’re immediately losing the advantages you’d set out to gain. Industry 4.0 often needs to cope with hostile environments with extremely high or low temperatures, or high moisture levels. Locations can be unstable or difficult to access and the presence of dangerous components poses fire and safety risks. Battery technology has traditionally included polymer or liquid electrolytes not able to cope with extreme temperatures or vibrations, which could cause potentially dangerous leakages. Batteries which are capable of operating at higher temperatures have generally been relatively large in size or not rechargeable. As well as the cost and safety impact of accessing and either changing or recharging batteries, the impact of waste through disposing of batteries which have reached the end of their short lives creates additional environmental issues. The batteries can be safely installed and left to do their job for up to ten years without needing any maintenance or replacement. The time and cost savings with this “Fit and Forget” model are clear, through removing the need to access components to replace or recharge batteries, especially where thousands of sensors are in play and particularly in the case of hard to reach locations. Ultra small form factor, long-life solid state batteries are the key to factories becoming and staying truly smart. 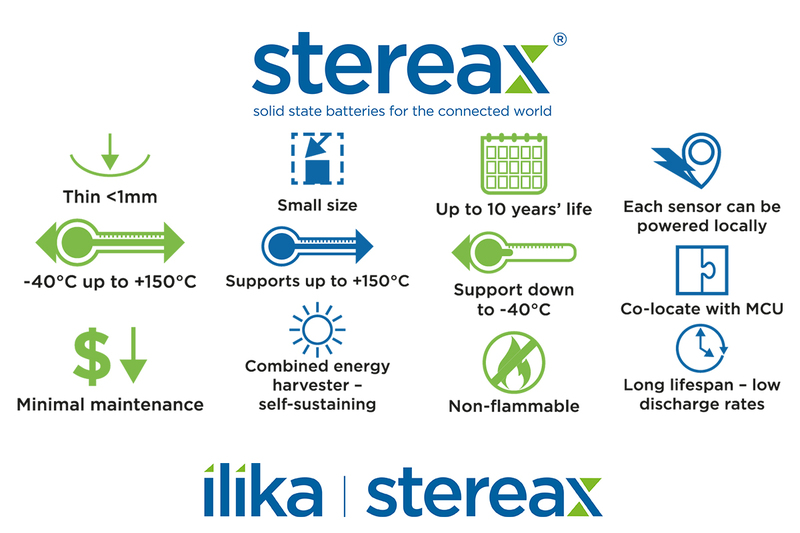 Ilika’s Stereax® P180 solid state batteries offer a wide range of operating temperatures and are capable of running thousands of cycles with energy maintained by fast charge as well as low self-discharge. The high energy density means that these batteries are miniature in size so footprint is not an issue. P180 batteries are moisture resistant with no risk of leakage as liquid or polymer electrolytes are not in use. All of these factors along with an eco-friendly design make P180 batteries the right choice for industrial environments where the challenges of extreme temperatures, vibration and hard to reach locations need to be overcome.